Home » Blogger » Blogging » Editorial » latest SEO news » Live Blogging » Programming » Reviews and Insights » SEO » SEO Consultants » SEO Services » SensorTower Review - App Marketing Made Simple! Being an indie developer and just beginning to learn how ASO works, I knew I needed help with optimizing keywords for my app. I've tried other ASO tools but they didn't help me enough. The previous tool I used to find good keywords for my app didn't provide me with enough information to determine what steps I needed to take to optimize my app and I didn't benefit from it. Then I came across SensorTower. What an amazing tool. I thought I knew about ASO, but I learned that I didn't know much until I got started with SensorTower. I signed up to receive emails that provided me with daily lessons for a clearer and easier understanding of ASO. SensorTower provides more information about keywords, and makes it easier to find a good keyword for my app. SensorTower has shown me that I picked the wrong keywords by using the other ASO tools. The data that is provided makes it very easy for me to understand the level of difficulty that my app would rank in the top 10 for that keyword, which is especially what I need to work on now. The UI of the website is very clean and it is very easy to navigate through pages. I would absolutely recommend SensorTower to anyone who is currently on the app store and is looking to fully optimize their existing apps or anyone new to app development that doesn't have any knowledge about ASO. I will continue to use this powerful software in the future for more apps that I will be developing and hopefully, thanks to SensorTower, my apps will reach top 100. When choosing keywords for your app, always make sure you focus on relevance first. The more relevant the keywords are to your app, the better chance it has of being noticed if those keywords are searched. For example, if I had an app called "Pop the Balloons", I would want keywords like "pop" and "balloons" rather than "angry" or "birds". The next thing to focus on is difficulty. SensorTower has their own great difficulty algorithm but basically you want to choose easy keywords that an everyday person would search for. Focus on simpler keywords rather than complex keywords. The last thing to focus on is traffic. It is a good idea to choose a keyword that has good traffic, but if it is used for a large amount of apps, it will be hard for your app to be found. 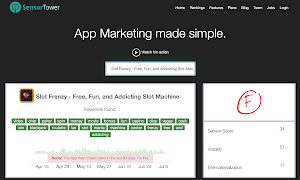 Focus on keywords that have good traffic but one that isn't used in a lot of other apps. I hope this helps anyone just beginning to learn about ASO and I highly recommend checking out SensorTower. My name is Jordan Ferris and I am a mobile app developer along with my brother, Jon. We call our little team GamesbyFerris. We've gone from knowing nothing about app development to creating a game and putting it on major app stores. After 6 months of development, we created Bear Master, a 2D casual game that is now available on the Apple App Store, Google Play Store, and Amazon Store. We love making games and there will be many more to come. Thank you for reading SensorTower Review - App Marketing Made Simple! posted on the website Kwentology if you want to redistribute this article please include the link as the source. Have some kuwento to share? Contact us!